Read the full report at the NOAA site. 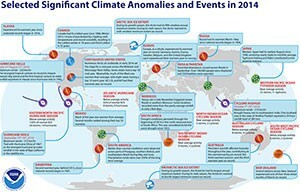 It includes a recap of the many significant weather and climate events around the world in 2014. Although there remains no clear consensus on the causes of climate change, the data and effects become more apparent every year. It is getting hotter with more extreme weather occurrences this decade. Clearly, the need to reduce carbon emissions and other known contributors to climate change is becoming irrefutable. CIMA continues to advocate for the practical and most cost-effective approach to reducing carbon emissions: improve energy efficiency in buildings and homes with Eco-friendly products like cellulose insulation. The U.S. has come a long way on the automotive front with vehicles continuing to show improved gas mileage and lower emission levels. Standards for improving the energy efficiency of homes has not followed at the same pace. In addition, the federal government continues to deflate programs like energy efficiency tax credits by funding these in arrears rather than in advance as an enticement. Improving the energy efficiency in millions of older homes, and constructing new homes and buildings with the latest innovations, and tried and true products like cellulose insulation made from recycled waste paper and produced with very low embodied energy, can make a significant reduction in greenhouse gases. Homeowners and businesses can drive the process by demanding better governmental action and by requesting energy efficient products when upgrading or building their offices and houses. The benefit of lower energy costs and the by-product of reducing carbon emissions is well worth the investment and effort. This entry was posted in Carbon Neutral Housing, Cellulose Insulation, Green Building, News & Information. Bookmark the permalink.